Do you need a collecting, import, or transfer permit? A number of sites and species require permits for collection or transport of aquatic organisms. The permits are from Washington Department of Fish and Wildlife (WDFW), and a final report of collections is required. Ask Megan Dethier about needed permits. The imported specimens must be kept in terminal quarantine: nothing goes to local waters; water is treated with bleach before disposal to a drain to sewer; solids are bagged and go to dumpster; work area must have a door with a lock and no drains to the sea. 3. 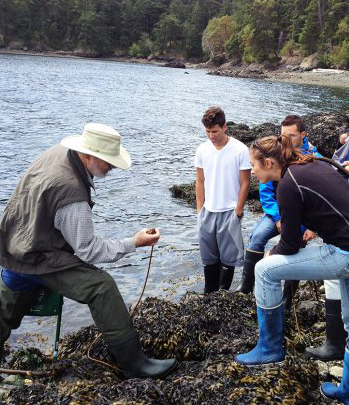 Permits for some transfers within Washington State are required because of risks of spreading marine pathogens and invading nuisance species. a. Species: the Pacific oyster Crassostrea gigas, the Kumomoto oyster Crassostrea sikamea, the European flat oyster Ostrea edulis, the Olympia oyster Ostrea conchaphila, the Mediterranean mussel Mytilus galloprovincialis, the geoduck Panope abrupta, the Manilla clam Venerupis philippinarum, the pinto abalone Haliotis kamtschatkana, the Japanese oyster drill Ceratostoma inornatum, and the European green crab Carcinus maenas. b. Sites: All sites outside the waters of San Juan County and Cypress Island. Also, sites of special concern in and near the San Juan Islands: Deer Harbor, West Sound, East Sound (Orcas Island), Westcott Bay (San Juan Island), Bellingham Bay, Samish Bay, Dungeness Bay, Hood Canal, Outer coast of Clallam County. 5. FHL permission is required prior to collecting within the marine preserves of San Juan County. Contact Megan Dethier for permission. Self-reporting under the FHL permits is now online. E-mail Kristy Kull for information on required permits, disposal of specimens, and reporting. If you use FHLʼs research vessel Centennial for collections under your transfer permit, give the documentation number 971152 for the ship. If you are returning specimens to collection sites, do not mingle them with organisms from other sites.